As Doctor Who fan you of course remember the episode with the Adipose and now you can replay that episode with this action figure set. In the set you will find a 5 inch tall 10th Doctor figure that can move things like his arms and more and to make this set so much more fun they added Adipose to them so with the Doctor and the Adipose you are ready to recreate the famous episode. 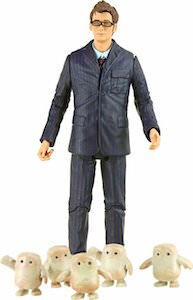 Of course this 10th Doctor action figure also belongs in your collection and some Adipose are always fun to own.